Representing a broad span of empires, cultures and religions during the sixteenth century, the Bruni and Bruti families exemplify a snapshot of Albania at a time when European and Ottoman histories collided. Only a small piece of the greater story, Noel Malcolm uses the Bruni and Bruti families to paint a panoramic landscape of history that covers the Venetian Empire, the Ottoman Empire, the Papacy, Malta, North Africa, Spain, southern France, Poland, and the Holy Roman Empire. Download a PDF or JPEG of the infographic. 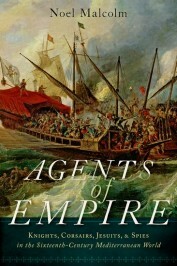 Noel Malcolm is a Senior Research Fellow at All Souls College, Oxford and author of Agents of Empire: Knights, Corsairs, Jesuits and Spies in the Sixteenth-Century Mediterranean World.